Any of privately issued general documents must have the signature and seal of a currently commissioned Ohio notary public. 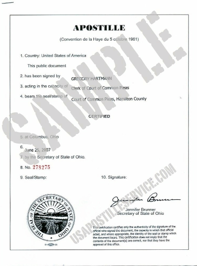 The county clerk of court of common please in the Ohio county in which the notary was commissioned must then certify the notary’s signature. The certification MUST have the county clerk of court’s signature and seal. 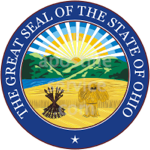 The Secretary of State’s office does not certify the signatures of Ohio Notaries Public. Birth certificates and Death certificates should be certified copies from the Ohio Department of Health or Vital Statistics. They should have an embossed (raised) seal and a signature of a registrar from the correct state agency. Certified copy of a birth or death certificate can be obtained at the Ohio Department of Health or at the Department of Health or Vital Statistics in the county the birth or death took place. Certified copies of marriage licenses or certificates MUST have the seal of the probate court and the signature of the judge. Marriage records are on file at the county probate courts. Certified copy of these can be obtained at the probate court in the county where the marriage license was obtained. A Certificate of Single Status can also be obtained at the county probate court. Certified copies of divorce decrees should have the seal of the county clerk of court and are on file with the county clerk of court of common pleas. Certified copies of divorce decrees can be obtained at the Clerk of Court’s office in the county in which the divorce took place. Photocopies of any of the above documents are acceptable by the Secretary of State if notarized by a notary public, and then certified by the county Clerk of Courts or notarized by an attorney notary, whose commission does not expire, and is commissioned in the State of Ohio.